You don’t have to look very hard in the news to find a story about a restaurant suffering from the perils a foodborne illness outbreak. Restaurant industry experts estimate that a foodborne illness outbreak can cost a business about $75,000. Food safety training can save your guests – and your restaurant – from the dangers of foodborne illness. Using an online food handler course will help ensure that your entire staff receives consistent food safety training. You can’t stop there, though. Food handler training must be ongoing, enforced, and part of your everyday duties as a restaurant manager. Make sure you’re following up on these specific topics regularly with your entire staff. Practice safe food handling. Food safety isn’t just about bacteria that starts out on food, it’s also about food potentially becoming contaminated by bacteria from other places, including from other food. Conduct follow up training regularly to ensure your staff is following safe food handling procedures. Store food properly. Does your staff understand the FIFO Rule? Rotating food following the “First In – First Out” procedure is critical to food safety and should be part of your ongoing food safety training. Keep food at proper temperatures. It’s a simple concept to reinforce in your training – keep hot food hot and cold foods cold. Your staff must understand that keeping food out of the “Temperature Danger Zone” as much as possible can help reduce the risk of spreading foodborne illness. The Temperature Danger Zone is between 41 degrees and 135 degrees Fahrenheit, or between 5 and 58 degrees Celsius. Enforce handwashing and personal hygiene. Reinforce to your staff the importance of handwashing, as well as the proper handwashing technique. Simply running hands under water won’t do. Spot-check staff to ensure they are lathering up with soap and washing for at least 20-30 seconds. Clean and sanitize. Follow up with staff to ensure they are following proper procedures for cleaning and sanitizing surfaces, utensils, knives, and dishes in food prep areas. If you have a seating area for guests, ensure tables, chairs, and high chairs are cleaned and sanitized throughout the day. 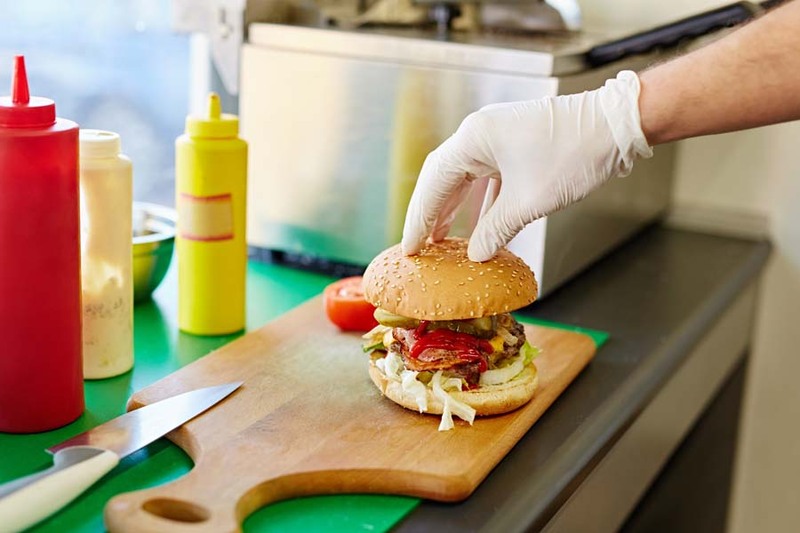 A foodborne illness outbreak can devastate a business, costing up to millions of dollars or even forcing a business to close. Training is the key to prevention. Click here for an easy-to-implement online food handler training solution.